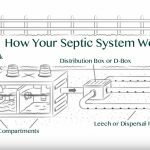 Are you new to septic systems? Have you just moved into a new-to-you home, or a newly built home with your first septic system to maintain and monitor? As a homeowner, it’s one of those “hidden” away systems of the home that can often be forgotten. Don’t make the mistake of letting that happen to you! 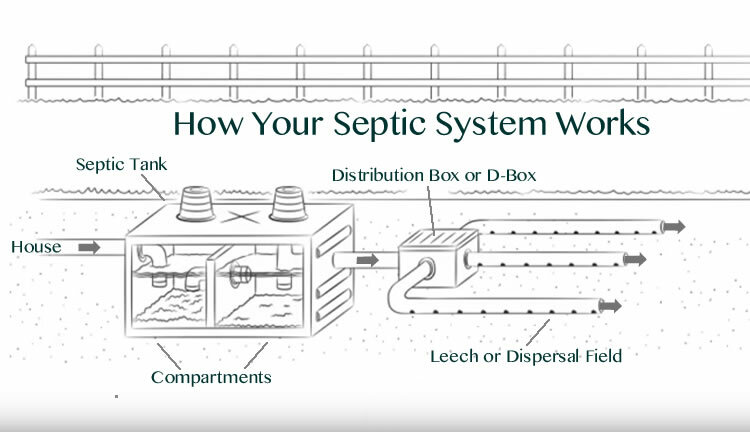 Many of the septic system owners within our Greater Victoria and Saanich Peninsula service areas have questions about their septic systems, and we have answers! I Opened My Septic Tank Lid And The Tank Looks Full? 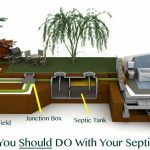 What Is A Septic/Sewer Clean Out? These are access points for your septic/sewer system. The clean outs are useful for serving your system if there is a clog somewhere or the need for a video inspection. As a homeowner it’s always a good idea to know where sewer clean outs are. They are usually a 6″ PVC pipe with a cap, extending a few inches out of the ground. What Is A Distribution Box or D-Box? The distribution box goes in between your actual septic tank and the leeching field. It’s job is to evenly distribute the effluent through your drainfield piping. If your tank isn’t pumped out when required the distribution box can fill up with solids, causing your septic system to eventually fail. What Can You Plant Over Your Septic Drainfield? Most septic professionals would agree that grass is the ideal cover for septic drainfields. Avoid planting over your septic covers no matter how unsightly they might be. 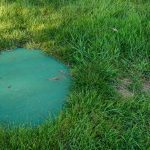 Consider consulting with a landscaping company as to the best way to hide the septic tank lids from view, rather than cover over them as they will need to be dug up for service and septic companies will charge you extra. Can You Plant Trees, Shrubs or Privacy Hedges Along A Septic Drainfield? out and grow into wet areas such as septic drainfields. The roots can infiltrate your drainfield pipes causing clogs and leading to eventual problems with the system. Avoid planting trees, hedges or shrubs on or within close proximity to your septic. Can You Plant Vegetable Gardens Over Septic Drainfields? No. Growing vegetables over a drainfield is notrecommended. Vegetables need watering and excess water in the soil reduces its ability to treat wastewater. The deep roots of some vegetables may damage drainfield pipes. Bed preparation, such as rototilling or deep digging, can also damage pipes. What About Landscape Plastic or Fabric Under Mulch? No. Plastic reduces the necessary air exchange in the drainfield soil. Even mulch or bark over the drainfield is not recommended because it reduces air exchange and retains water. Can You Park Vehicles, Boats, Trailers or RV’s On Your Septic Field? Not a good idea! If it’s a lawn tractor you’re probably OK but if you want to park your 12,000lb 5th wheel trailer on top of it, you’re likely going to damage the drainfield and the piping system with the weight of the trailer and your truck when you hook up to move it. Vehicles, boats, trailers and RV’s should be parked off the septic drainfield and off the reserve field as well. Can You Build A Shop or Garage Over Your Drainfield? No, and the same would go for a parking pad, carport, hot tub, deck, and any other hardscape or structure. You want to eliminate any driving over the drainage field and you also want to avoid interrupting the evaporation process and oxygen supply to the soil in your dispersal field. Does Livestock Need To Be Kept Off Septic Drainfields? In the winter, livestock trample and muddy the soil; in the summer they compact it. Again, this is not good for the soil’s ability to exchange oxygen. Even a dog kennel or confinement area should not be situated over the drainfield. Rain Water Is Directed Onto My Drainfield. Is This A Problem? Yes. Depending on the quality of drainage on your property, extra water will saturate the soil and prevent the drainfield from treating wastewater properly. Downspouts and stormwater from surfaces such as driveways and patios should be diverted away from the septic tank and drainfield. Sometimes the construction of a small trench or channel uphill from a drainfield can help direct water away. How Close To The Drainfield Can I Install a Sprinkler System? Water lines should be at least 10 feet from all components of the septic system. Be sure all sprinkler lines are fitted with approved backflow prevention devices and check them annually for leaks. How Does An Effluent Filter Protect My Drainfield? An effluent filter fits securely in your outlet T and is highly effective at keeping solids out of the drainfield. 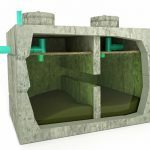 It forces the wastewater to pass through small holes before entering the drainfield and keeps solids inside the septic tank where they can be pumped out. They range in price from $75 to $300 and are well worth it. How Does Your Soil Treat Wastewater? The soil actually filters out the particles that make wastewater appear cloudy. Organic matter is removed from the effluent as it is a food source for many micro-organisms that live in the soil. Disease-causing bacteria are filtered out of the wastewater by the soil and once trapped, either die in this hostile environment or become a source of food for microorganisms. Viruses are chemically attracted to soil particles which removes them from the wastewater. My Roof Gutters Are Connected To My Septic System Is This Ok? No. “Clean water” wastes, such as footing drains, roof drains, water softeners, or dehumidifiers do not need to be connected to the septic system, they only add excess water. Water conservation should be practiced in order to minimize the flow of water through the drainfield. If you’d like to receive a quote to pump out your septic tank or holding tank please give us a call (250) 415-8558 or fill out our contact form and we’ll get right back to you.